(Bloomberg) -- China said U.S. Secretary of State Michael Pompeo “recklessly slanders and deliberately provokes” after he blamed Beijing and Moscow for spreading disorder in Latin America. 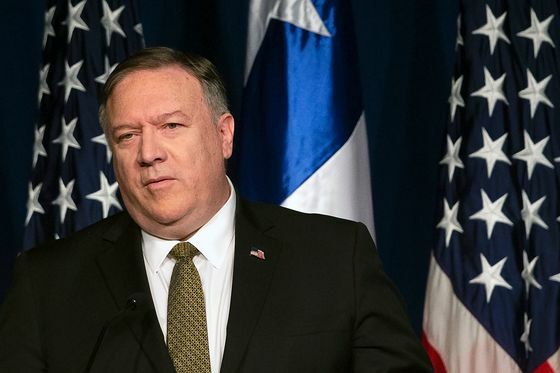 Pompeo, who spoke on Friday in Chile as he started a quick South American tour, said China and Russia fueled corruption and aimed to undermine democracy across the region. Among examples he cited were Chinese loans to the regime of embattled Venezuelan strongman Nicolas Maduro and his predecessor Hugo Chavez. Political turmoil engulfed the country in recent weeks after the U.S.-backed opposition leader Juan Guaido’s bid to unseat Maduro. Guaido urged China to “add its voice” to those who recognize him as Venezuela’s leader in an op-ed for Bloomberg Opinion on Monday. The economic relationship between China and Venezuela is bound to grow given China is the world’s largest oil importer and Venezuela has the world’s largest proven oil reserves, he wrote, adding it’s in Beijing’s interest to bring about stability in the Latin American country. “China’s stance on Venezuela has been consistent and clear: We safeguard the UN charter and the peace and stability of the region,” Lu said.